In any enterprise, Marketers and other line-of-business professionals have the best knowledge of their company’s mobile audience: customers, prospects, and employees. Yet, mobile app development is traditionally viewed as the job of the IT department. 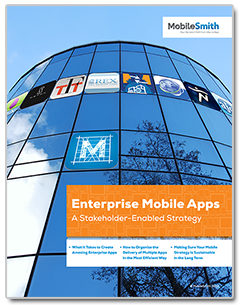 How can a marketer gain control and implement an efficient, flexible enterprise mobile strategy closest to the needs of the end-user? Is there a way to do it without turning to the IT, or hiring costly developers? All this – with minimal or zero involvement from your IT!